This beautiful 2007 Porsche 911 Carrera S Cabriolet was sold new by our store in 2007 and is now being offered as a Porsche Certified Pre-Owned Vehicle. 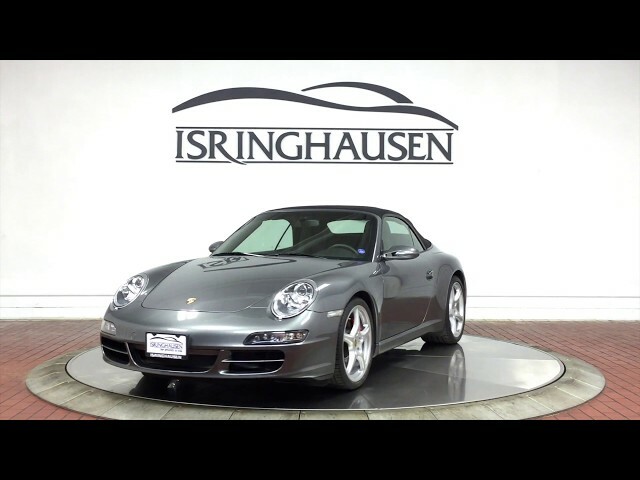 It has a fantastic configuration starting with Meteor Grey Metallic Exterior with Black Interior and factory options including Sport Chrono Package Plus, Power Seat Package with Heated Seats, Navigation, 19" Carrera Classic Wheels and much more. To take advantage of this well equipped and well maintained 911 Cabriolet just in time for Spring, please contact a Porsche sales specialist today by calling 877-362-9715. Isringhausen Imports is Central Illinois' premier new car, used car and certified pre-owned (CPO) dealership for quality BMW, Porsche, Volvo and Mercedes-Benz vehicles. At Isringhausen Imports, we have become a leader in the industry by working each day towards the greater good of our customers, our fellow employees, and our community.